Many American craft brewers have been inspired by the diverse and storied ales from Belgium. One of the keys to great Belgian ales is the yeast, which gives the beer funky and fruity notes that nicely complement the hop and malt flavors in the beer. Mystic brewery in Chelsea MA focuses on brewing Belgian-style ales with a blend of yeast they’ve developed and fermented in house. While many American craft breweries focus on the Trappist Belgian ale styles developed by monks, Mystic focuses on saisons, or Belgian farmhouse ales. The saison style was traditionally brewed on farms for the laborers to drink, and thus the style has a lot of variability. This gives brewers a lot of latitude in the style, while most saisons are light in body and moderate to low alcohol, there is a large range of malt and hop profiles and the differences in yeast strains has a major effect on the final product. Before effective sanitation it was unsafe to drink most water sources in Europe, as it was often contaminated by harmful bacteria. For this reason people would drink low-alcohol beer instead of water (there wasn’t any understanding of micro-organisms, so they didn’t realize that the boiling of the wort was sterilizing the water). This necessity led to the light session beers of Belgium, which is the inspiration for Mystic Table beer. 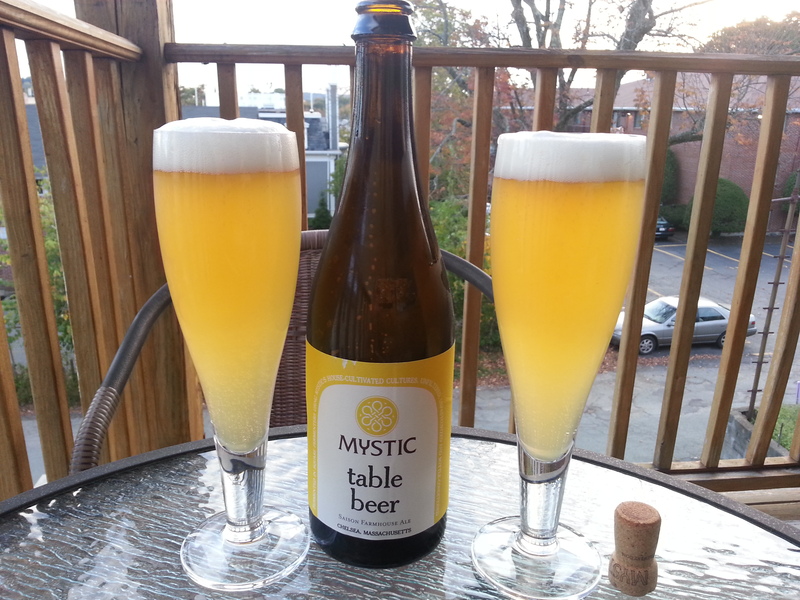 Mystic Table beer pours a golden yellow, slightly hazy with a sustained white head. The Belgian yeast is evident on the nose, slightly funky with some grassy hops. The beer is light and very easy to drink, some mild funk and fruity esters from the yeast, a solid malt backbone balanced by mild bitterness from the earthy hops. The beer is mild but also complex, there are a lot of flavors there but they are all subtle and complement each other well. At 4.3% ABV it is a perfect session beer, have a big bottle on the porch while grilling of serve a few instead of wine at a dinner party. The beer also goes very well with food, the delicate flavors should nicely complement even light meals. Hoppy Boston score: 4.25/5.